The infrared sauna at J’L NOW OPEN! * If you would like to use the sauna before your massage session, please call 707-763-6888 to allow us 1 hour ahead to preheat the sauna to the desired temperature. If it’s your first time at our center or you do not get massage ofter, Swedish is the best place to start. Most people get a 60 minute Swedish Massage, but 90 minute gives the therapists more time to work the muscle tissues and achieve better results. This is a great massage for relieving tension by calming the nervous system. Most massage therapists use their palm and fingers to relieve your stress. If you want a deeper massage and can tolerate more pressure for relief from chronic muscle pain, our therapists use firmer pressure in order to reach these key areas and get them to release tension, which is why this particular massage is often recommender for people who are comfortable with a slightly more intense touch. We recommend medium-5 to firm-10 pressure. * If you prefer to only focus on one area of your body for your full session, there will be a $10.00 extra charge. J’L signature natural heated smooth stones are placed on certain points on the body. The stones warm up and loosen the tight muscles, balance the energy centers in the body and apply gentle pressure to the muscles. Before the massage, our therapists will provide a diagram of the body where the clients can indicate areas of concern. The therapists will use the hot stones to apply a gentle circular movement to the body which improve circulation, release toxins, and calm the nervous system. The warmth is comforting. Hot Stone Massage is good for people who have muscle tension, chronic low back pain, and sciatica. Our center offers many different types of essential oils such as synergy oils blends. The essential oils are highly concentrated liquids distilled from plants. Different oils have different characteristics and uses. Aromatherapy massage is particularly suited to stress-related conditions or conditions with an emotional component. This is very popular massage session to release anxiety and depression. 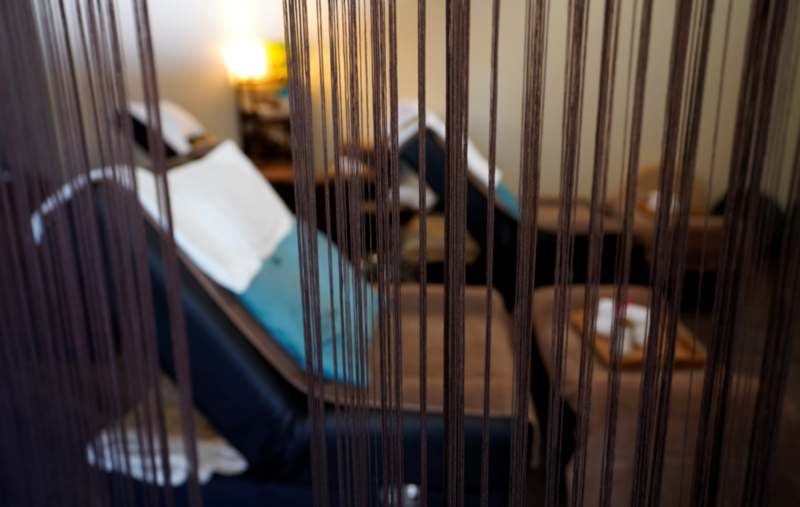 The clients will start by lying on the comfortable sofa to receive a 30 minute Foot Reflexology, and then will move to a private room to obtain a 30 minute Back Massage. This is a popular combination for people who have sore feet and also back tension. The clients will obtain a unique and special experience of massage by four hands. Two massage therapists use their professional techniques in combination with a soothing touch to rejuvenate your body. By soaking your feet with tea tree essential oil and sea salt bath, than we apply pressure to certain points on the foot that correspond to organs and systems in the body. Foot Reflexology is very relaxing, especially for people who stand on their feet all day, runners or those who just have tired, achy feet. Also, we offer homemade foot bombs in several scents. * Add Hot Stone, Bath Bomb or Sugar Scrub for $5.00 each. This type of massage uses a specialized chair to obtain a professional massage on your upper body. This is good for people with busy schedules, and is a great choice for relaxing the upper back, shoulders, and neck.